As with any place in Scotland, you can feel the rich history and pride of the past where ever you go. The grandness of the hills, the crystal blueness of the skies (when it’s not raining) and the feeling of being part of the land you are travelling in, can be quite overwhelming. With an impressive array of architecture and magnificent floral displays, it is a beautiful and relaxing place to spend time in. Whether its long walks along the river banks, a look around the local museum and art gallery or a rummage through the lots of lovely little boutique shops, whatever you are interested in, you will find it here. Car hire in Inverness is advisable you can see the sights and visit the attractions much more easily and conveniently, and in a time that suits yourself. The Eden Court Theatre, situated near the cathedral is the place for shows, music and a cinema. There are a number of outdoor pursuits and the Tiso Inverness Outdoor experience has a climbing wall and you can also hire bikes etc. Although the legendary Scottish weather ensures that you always pack an umbrella and bring a pair of wellington boots, it doesn’t detract from its beauty. When the mists are rolling in and there is a light drizzle Inverness is truly a magical and enchanting a place to be. A great day out is a cruise on Loch Ness and a search for the Nessie. You may also have to watch out for some 3 legged haggis in the hills!! There is also Saint Andrews Cathedral to visit, which is a towering building dating back to the 16th and 17th century. In contrast, there is also a shopping centre which includes all the modern shops you will ever need, and lots of the arts and craft shops which you can find fascinating and unique gifts to take home with you. Inverness Airport serves as the major airport to Inverness. You can book your car rental online and collect it upon arrival at the airport. No hassle, no fuss. With a wide selection of bed and breakfasts, hotels, cottages, caravans and self-catering accommodation, your accommodation needs should be easily met. Try the black pudding, square sausage and haggis, enjoy a wee whisky and some homemade shortbread – it may be slightly cliché but that does not detract from the taste or experience. Try a pub lunch and test out the real ales. Relax and unwind. 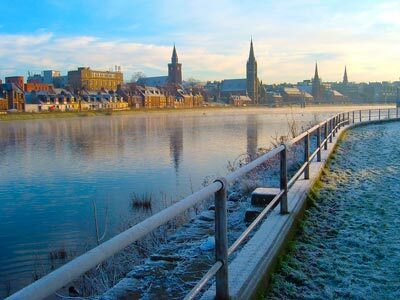 However much time you spend in Inverness, you will wish you could stay for longer and probably will end up doing so. Rentalcargroup.com compares car rental prices for Inverness Airport). We work with many car rental companies so the quality of the cars is guaranteed. This way you will be sure to get a rental car that suits you the best and for a competitive price. Last month, the average car rental length at Inverness Airport was 5 days. The average rental car length at Inverness Airport is 4 days. The most booked rental car type currently at Inverness Airport is COMPACT cars. Last year, the most booked rental car type at Inverness Airport were COMPACT cars. How much does it cost to rent a car at Inverness Airport? Last month, the average car rental price was 116 USD. Last year, how much did it cost to rent a car at Inverness Airport? Last year, the average car rental price was 169 USD. What is the current average daily price to rent a at Inverness Airport? Last month, the average rental price was 25 USD per day. How much did it cost to rent a car at Inverness Airport over the past 12 months? Last Year, the average rental price was 40 USD per day. The car rental companies available at Inverness Airport are: Alamo, National, Interrent. See below last 5 customer reviews. Our customers rated Inverness Car Rental with an average of 0.00 based on 0 ratings.